Unlimited, real-time log parsing enables users to define and identify field values using named capture groups from almost any log format from structured, to semi-structured, to completely unstructured. 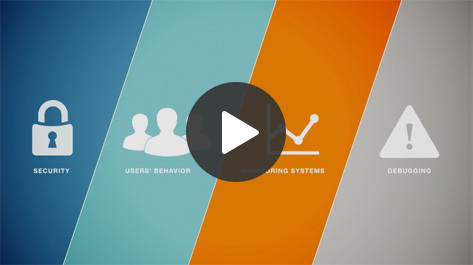 Users can easily group, name, and perform advanced analytics for deeper understanding and assurance of application performance, user experience, and cross-system behavior. Users no longer need to configure logs into a known format and can immediately analyze and trend key data points such as website response times, http status codes, sales and marketing transactions, and important security events. Identify important pieces of information or metrics in logs from any device or system, in any format. Use standard RE2 Regex syntax and named capture groups to identify and work with key metrics in your logs. Use logs in any format for advanced search and analytics functions including ‘Group by,’ ‘Count,’ ‘Sum,’ ‘Average,’ ‘Count Unique ‘ etc. Save queries and build dashboards for logs produced by any system component (custom, database, web server, firewall, router) on any operating system (Windows, Mac, Linux etc. ).